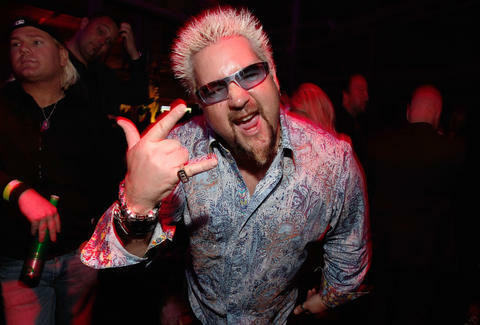 Chances are when you think of Guy Fieri you feel a little warm; whether that's contempt flaring up or the cozy blanket of love varies from person to person. If you're in the former group, maybe turn back now, and definitely stay far, far away from New York this weekend: FieriCon is back and expected to be even bigger than last year's event of 100 people, according to the New York Post. Just to be clear, this is a bar crawl where everyone is dressed as His Earnestness of Flavortown Guy Fieri, he of hair spikes and leather bracelets, the venerable host of Diners, Drive-Ins and Dives. As a tribute to this, shall we say, divisive figure, over 100 revelers will meet at the Hog Pit in Midtown Manhattan at 1pm. The armada will then conquer several other bars and restaurants on its odyssey to Guy’s American Kitchen and Bar (which by the way received one of the greatest and cruelest restaurant reviews of all time, courtesy of New York Times critic Pete Wells). The unstoppable cavalcade of spiked hair and cheap booze will also stop at Pioneers Bar, Stout NYC Flagship, and The Keg Room before settling down for the dinner of a lifetime. Roughly an hour will be spent at each location... but at what cost? “Guy is one of the most hilarious and absurd human beings in the world,” David Gold, one of the founders of the event, told the New York Post. "We just thought, it’s kind of amazing that this guy can go through life dressing like that and talking like that, and we wondered what it would be like to do that for a day." To aid yourself in this radical act of empathy, you're encouraged to order his hair and goatee for $10.50, his leather bracelet for $1.99, a shirt with flames on it, and X-Loop sunglasses, which "must be worn backwards," for $5. It's your life -- or, technically, his. But no one can stop you from doing this. James Chrisman is a News Writer at Thrillist who will not be joining the festivities. Send news tips to news@thrillist.com and follow him on Twitter @james_chrisman2.